Never one to slow down, Simon’s latest endeavor is beekeeping and honey production. He maintains about 80 hives around the land near his Mbahe Village cottages, at his new home in Mweka Village by one of the Kilimanjaro National Park exit gates, and at the TPC sugar plantation off the mountain south of Moshi Town. Simon’s obsession grew out of his consumption of honey as a superfood full of energy to sustain him during his long training runs on the mountain. 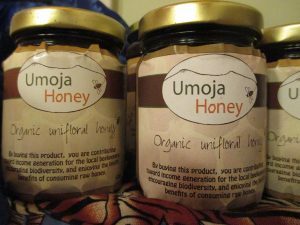 Now, in addition to producing honey under the Umoja Honey label, which can be found at the table at Mbahe, on all climbs and SENE camping safaris, and included in the box as part of his local Moshi CSA (community supported agriculture), Simon is educating those in his community about using modern man-made hives. The latter do not require fire, as traditional honey harvesting methods do (often leading to uncontrolled wildfires). In open-minded spirit Simon has hosted a number of international apiculturists/apiarists (fancy terms for beekeeper) from Kenya, Israel, Germany, and the United States to his mountain hives. And he himself has made several pilgrimages to visit a fellow Tanzanian beekeeper, Mr. Barakael Mkenda, who lives in the West Kilimanjaro area and raises stingless bees. Stingless bee honey is a bit tangier and less robust than the stinging variety, but the hives, a traditional Tanzanian style made of hollowed-out logs, can be seen dotted throughout Barakael’s family compound – under the eaves of the house, around the yard, and throughout the animal pens. Simon now includes numerous stingless bee hives among his collection. 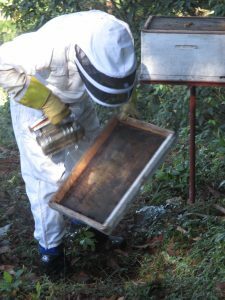 Simon would love to show you his hives and talk honey production with you during your visit. For those with a deeper interest, we can arrange a daylong “honey tour” with Simon to visit the stingless bee hives and other of Simon’s secret “sweet spots” around the mountain. See also this teaser video by National Geographic about Simon the beekeeper: The Honey Bee.